Every day we talk about how relevant being online is. How traditional media is facing a huge dilemma and how Twitter is so far breaking news faster than any one could imagine. And so as a advocate of Social Media I have strong feelings for news online. And I also have a soft spot for the traditional media; after all ‘it gave birth to my instincts to join journalism.’ As I struggle to defend my position, I realize that the transition and the future is reliant on so many things. However what we need to never stop doing getting “the basics” right as news tellers. This is why I am saying what I am saying. how is traditional media responding to the rise of social media? The changing face of African Media: what are the opportunities of public participation? News and information have become more immediate and omnipresent than ever. How does this affect policy-makers’ actions and individuals’ personal roles in political communications? Does Africa’s online revolution present an opportunity for democratization? These are questions that are worth asking and while they may not get comprehensive and immediate answers but they do create a buzz or conversation. First forward; I got back yesterday morning and had to sleep off the jetlag. In the evening I got onto my computer and there was a #Payme96mn hashtag that had Ugandans all riled up. I asked for what was going on before I could contribute or rather to get some context. 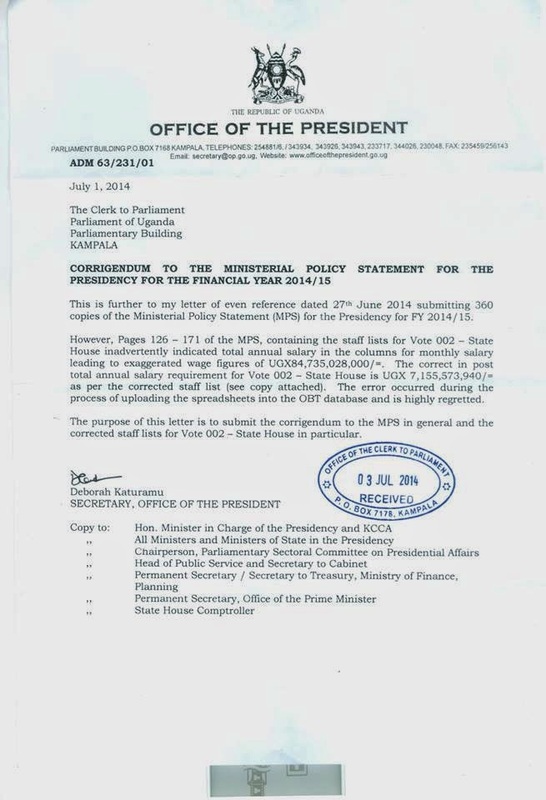 I was forwarded a document via email and told some people are earning 96 million shillings [about $38,400] in State House. Funny thing is I went through the document, but failed to find the said 96million shillings. [I want to blame the jetlag]. The document was the Ministerial Policy Statement for the Presidency. It has in detail the planned outputs and activities and budgets for the year 2014/2015. It was tabled before Parliament yesterday evening. NTV run a story in their prime news bulletin that was in line with the hashtag. It showed members of Parliament commenting about the estimates in the budget specifically in reference to the members of staff of the State house that are earning 96 million shillings and 78 million shillings. I remember a Member of Parliament asking if they were ‘super’ civil servants. This morning a presser was released saying that the ‘commas’ were put in the wrong place. This meant that it is supposed to be 9,600,000 million shillings per month [$3,840] at the current rate. It was a face palm moment for me when I found out that, because of the comments that I saw on Twitter yesterday. Though some people still say that the ‘presser’ is not explanation enough. When I first heard of the salary, I thought to myself: that is not a lot of money. They must be very skilled at what they do, or they must have high risk jobs. I thought about the animal farm ideology and the fact that while all animals may be equal, some are more equal than others. The truth is people do get this amount of money per month and much more. Whether they are civil servants or owners of the businesses or companies, they do. It is a lot but not that a lot. was.” The document is about 450 pages, the focus was on one page. 2014/15 it will be 10bn. budget, that would bring the figure to about 600bn. in FY2014/15. Also presidential donations will increase from 80.6bn to 90.6bn. doesn’t this translate into reduced expenditure? For the media, Can we blame “shrinked” newsrooms? Fact – checking is a basic, but one that we seldom pay attention to. As we look for someone to balme, how about we get down to doing our part right, fast? Both the social media gurus [who created the hashtag] and the traditional media [that run the story] did not think about the other side of the story. Do the numbers add up? What is the budget looking like? Why this much? If the media in Uganda wants to be a respected institution as the 4th Estate, then the respect must be earned. If the social media ‘gurus’ want to be respected, we need to get the basics of news telling right as well. democracy in Africa. It is fast, it is quick: but we have to get the basics right. We need to! I don’t know if I would have thought like Mark. As a journalist or Editor, I don’t know if I would have thought and done better. But I have learned a huge lesson. When I comes to unconfirmed news, I am also a very sceptical person when when everyone seems to believe what is on the news. Another good example, this story,"A man has been arrested in a salon at forest mall with explosives and has been wired to blow, a second suspect has been arrested as well." As soon as I read that, It didn't make any sense whatsoever but it was retreated and pictures of the "man" were plastered all over the place and Ugandans were even questioning the security agencies. A few hours later, the man was in fact a woman with no bombs and was at the salon to get service. The danger here is once that information gets out, it is lost forever and it is quit w damaging to a person, now imagine the trauma of what the poor woman went through. The competition of being the first to report something is now more important than first finding out if something is actually true and people have this belief of if someone has reported it then it must be the truth. Honestly this must all change.